Modern electronic circuit boards are populated with densely packed resistors, capacitors, integrated circuits, and other components. The demands of high capacity production coupled with equally high quality require automated soldering operations. Hand soldering is still a necessity for rework and maintenance, however. 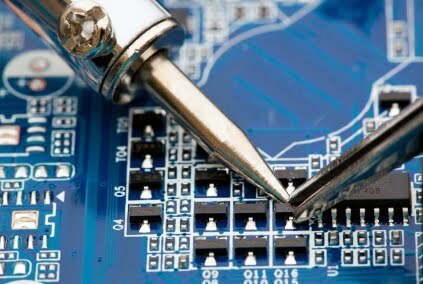 Formal training in soldering is an advantage for students and technicians, if only to prevent expensive damage to circuit boards. When a student tries a new tool, she'll make some mistakes and learn from them. When a technician knows a job is beyond his capabilities, he's right to pass it up. Printed circuit boards consist of a substrate, usually a material with good thermal and dimensional stability such as fiberglass, and etched or printed copper conductors. Complex circuit design sandwiches boards together with plated through-holes providing connections between the layers. Most components are designed to be soldered directly to the surface of the board. Leads may be tightly spaced. Flash memory chips, for example, have leads that are less than ten thousandths of an inch wide and ten thousandths of an inch apart. Hand soldering must be done carefully to avoid damage. IPC-Association Connecting Electronics Industries sets voluntary standards for soldering, inspection, and manufacturing processes as developed by their members. Products are divided into three classes determined by the intended use. Class 1 contains general products. Class 2 requires better performance and longer life. Class 3 is for critical systems operated in harsh environments. Within each class, components must be soldered to the same standard regardless of size. Inspection is primarily visual, so a uniform appearance helps to spot discrepancies. Solder is typically categorized in terms of leaded and lead-free alloys with lead free being ROHS Compliant to the EU (European Union). The most common is an alloy of lead and tin but due to environmental concerns it is being phased out in favor of lead-free alloys. Lead-free solder is not without problems, however, and its use is currently undergoing analysis for use in aviation, medical and military systems. Lead-free solder melts at a higher temperature than lead/tin solder, requiring greater care when soldering tiny leads and pads. Over time, it can develop tin whiskers that bridge gaps and cause failures. Additionally, tin is a commodity and is mroe volatile to costs. Lead-free solder costs more than tin or lead solder. Soldering tiny components requires a binocular magnifier at the very least. Better results can be obtained with a binocular microscope - especially for technicians with waning eyesight. Dedicated soldering stations should be equipped with precise temperature controls and an assortment of soldering iron tips in various sizes. Separate tips should be maintained for lead-tin and lead-free soldering. Alternatively, tips can be cleaned and re-tinned with the correct solder prior to use. Hot air can be used for hand soldering, and some stations are equipped with hot air hand pieces that are used in conjunction with paste solder. The paste consists of tiny solder balls mixed with flux and is ordinarily applied with a syringe or automatic dispenser. As the solder melts, capillary action causes components to be centered perfectly on their pads. Many stations have thermal tweezers for removing and installing components. Large IC’s can be removed with thermal tweezers, but there is a risk of damage to the board. Such components are more safely removed with a hot-air desoldering station. For all of your soldering and desoldering needs, including the new JBC Tools Nano stations for microsoldering, consult the product and assembly experts at Janel Online. We're available via phone or e-mail to answer any questions you may have, and look forward to helping you achieve your solder or rework goals.